A skelelton suit made from nankeen, c. 1800. From Victoria and Albert Museum. My family and I are heading off to a Regency Picnic held in Melbourne in March, so I am madly doing costumes for some of my children who don’t have anything to wear as yet. My two-year-old boy is one of these, and I decided to make him a Regency skeleton suit. Skeleton suits became increasingly popular during the 1780’s and 1790’s, and they continued to be used until the 1840’s. The suit most often comprised a long-sleeved jacket, with matching long pants (with a fall-front) that could be buttoned together to form a type of romper suit. Sometimes the jacket could be short-sleeved, and the jacket collar varies from a short, stand-up collar, to one with fold-down lapels, and sometimes even no collar. The suit set occasionally included a matching waistcoat that could likewise be buttoned to the pants. The pants were sometimes more similar to short breeches (reaching only to the knee), but most often were to the ankle. They also could have a button placket at the bottom of the pant leg to aid in dressing. Buttons were often self-covered to match the suit, but could also be metal. Underneath this suit the child generally wore a boy’s shirt, which was a version of the man’s shirt popular in the 18th century. In the previous post in this series I made a little boy’s shirt, and in this post I will share my progress in making the boy’s pants. The pants were made from burgundy cotton broadcloth, with wooden buttons. Step One: I cut out the pattern in a similar way to the breeches I have made before. It is really the shape of the pattern that you want to replicate, regardless of the size of the person. In particular the back panel piece is shaped to give the pants a “splayed leg” appearance, which allows movement for horse-riding. The baggy seat of the pants is part of this. Step Two: I sewed the two inside leg seams first (the front piece to the back piece), and then I sewed the crotch seam (which is the centre back seam and the centre front seam, joining in the crotch). The inside leg seams are sewn and the crotch seam is pinned, ready to sew. Step Three: Before the side leg seams are sewn, it is a good idea to sew the fall front. I did this a bit differently than I have done before. First I laid the front panels together and made a slash through both layers. This made the slashes both even. The front panels of the pants sit right sides together, and a slash is made through both layers for the fall front. Second, I cut a rectangular piece of material about an inch wide and folded (and ironed) 5mm in from each long edge. I sewed this piece (right sides together) to the side of the slash that is closest to the centre front (the one that actually forms the fall front). I used a 5mm seam allowance, tapering to a smaller allowance at the bottom of the slash. The rectangular portion was then folded to the inside to cover the raw edge, similar to the way bias-binding binds raw edges. This is the inside of the front panel. The slash is parted and folded back and I have marked the stitching line with a red line to make it easier to see. Third, I cut two pieces to go under the fall; I call them “under-fall-flaps” for want of a better description! These two pieces will be attached to the waistband and to the outer slashed edge. I hemmed the bottom edge of both pieces and also the edges that are closest to the centre front. These two pieces sit under the fall front. Only the bottom edge is hemmed in this photo. I then sewed these pieces to the other side of the slashed edge, using a seam allowance of 5mm, tapering to a smaller allowance at the bottom. These “under-fall-flap” pieces can then be folded to the inside to sit under the fall. The raw edges do need to be neatened, which I did with a very tight zig zag. The “under-fall-flap” is pinned, ready to sew, to the other side of the slash, right sides together. Lastly, I trimmed the bottom of the rectangular piece to form a neat little point. This covers any raw edges at the bottom of the slash, and is top-stitched for reinforcement. I have never done this type of fall front before, but I think it looks really good! The reinforcing stitching at the bottom of the fall front. At this point, the outside leg seams can both be sewn. This is also the point that the side pockets can be assembled. This pattern has two pockets (one in each side seam), plus a third welt pocket through the waistband. I did not put any pockets into my pants though. Step Four: The waistband can be interfaced, especially since it is generally so wide. I sewed the waistband piece and the waistband facing (seen here with the interfacing ironed on) together on three sides, with one long edge of the facing folded up and left unsewn. The waistband sewn, with one edge of the facing folded up. This folded up section is used to hide the raw edges once the waistband is sewn on. The pants can then be sewn to the waistband. For this part, the fall front is left free (to be buttoned to the waistband later), but the “under-fall-flaps” are sewn to the waistband instead. The centre back portion of the pants is gathered to fit the waistband, thereby providing the baggy seat. The pants have been sewn to the waistband, and all raw edges have been tucked under the facing. It is pinned, ready to hand sew down. The fall front can be seen pulled down in the centre. Step Five: The buttons and buttonholes can be sewn to the front. The buttons on the fall front. Note: In the pattern, the fall reaches higher than the top of the pants so it can be buttoned on to the waistband. Unfortunately I trimmed it off by mistake, so I had to sew a wide “binder” piece onto the top of the fall to use for buttoning. Step Six: The button placket on the pant legs was used to help the foot go through tightly fitted pants. These pants weren’t particular tight, but I thought it might be a nice touch to include them. Firstly I cut a rectangular piece of fabric about 2 inches wide and folded it in half. (It needs to be as long as you want your placket to be.) According to the pattern, this placket is actually cut as part of the leg piece but I forgot to include it. The buttons are put on this flap and it is tucked under the other edge to be buttoned up. The pant legs, shown with a button placket. The top edge of the placket can be sewn and turned the right way. Once that is done, the long edge of the placket can be sewn to the back side of the leg seam. The placket sewn on (the longer red line). The top edge of the placket was sewn first and turned the right way (shown by a short red line). The placket can be then folded to the inside, the raw edges can be tucked under and then it can be sewn down. The placket has been folded to the inside and pinned down, ready to be hand sewn. On the other seam (opposite to the placket), I sewed a little rectangular piece of material. This was to reinforce it so that the buttonholes could be put here. On the other side to the button placket, is a small piece of material used as reinforcement for the buttonholes. Then the buttons and buttonholes can both be put on. I put extra buttonholes in the placket so that, when I let down the pants, all I have to do is put more buttons on the bottom. Step Seven: The pants can be hemmed at the bottom. Three more buttonholes should be put in the waistband, at the centre back and one on each side, for buttoning to the jacket. Stay tuned for the final post in this series, the jacket. 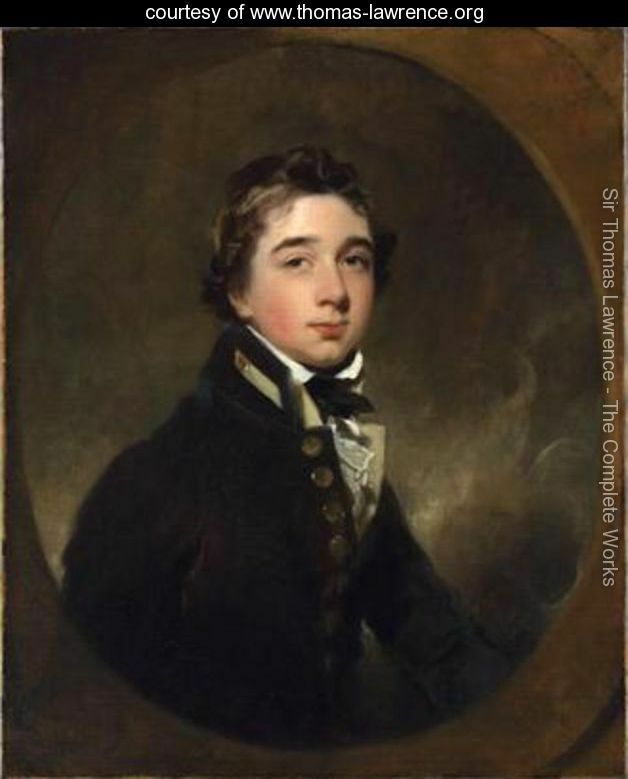 Midshipman Michael Daintry (1813), painted by Thomas Lawrence. Since my 9-year-old son asked to come to the Jane Austen Festival, I have become inspired to make him a midshipman uniform for the occasion. He also seems rather keen to go to “Book Week” as “Mr Midshipman Hornblower”, which could be interesting for him! There was no sign of anything brewing while dinner was being eaten in the great cabin of the Indefatigable. Pellew was a courtly host at the head of the table. Conversation flowed freely and along indifferent channels among the senior officers present – the two lieutenants, Eccles and Chadd, and the sailing master, Soames. Hornblower and the other junior officer – Mallory, a midshipman of over two years’ seniority – kept silent, as midshipmen should, thereby being able to devote their undivided attention to the food, so vastly superior to what was served in the midshipmen’s berth. For the second post in this series, I will be making an 18th century boys shirt and stock. Generally speaking, men’s 18th century shirts were all made along the same lines. They were made from rectangles and squares, neatly cut as to have little offcuts, and rather roomy in the body, only fitting closely around the neck and the wrist cuffs. 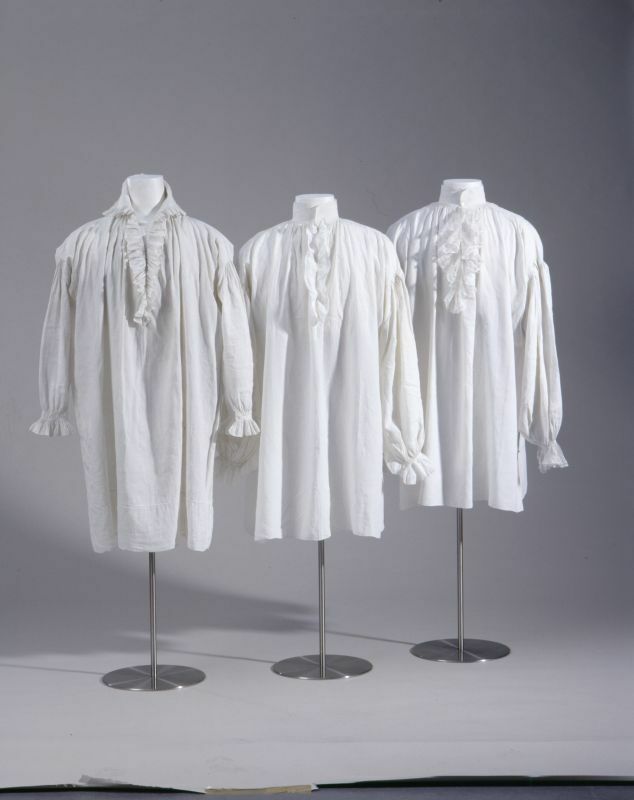 Late 18th century linen shirts, from Germanisches National Museum. The front ruffle and the wrist frills can be easily seen. In addition to this, midshipmen from this Regency period all seemed to have a front frill on their 18th century shirts, which is often seen peeking out from below their neckstocks. However, they do not seem to have the corresponding frill around their wrists, which was so popular during the 18th century. Using this information, I made my-little-midshipman a shirt. 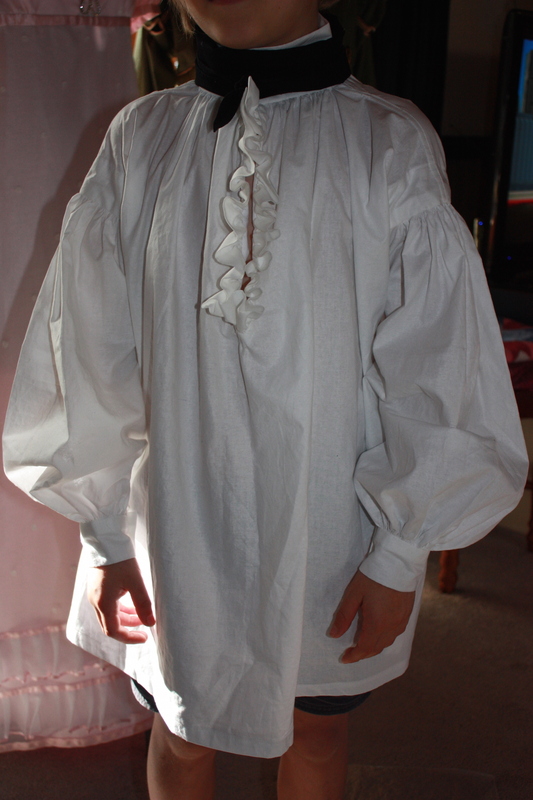 I last made an 18th century shirt when I was making a Regency costume for my husband, so I simply referred back to my post and followed the same process using the smaller measurements. There is a basic pattern for a shirt in Norah Waugh’s The Cut of Men’s Clothes, or there are various places online to look for making an 18th century shirt. I made this shirt from white cotton broadcloth. It has a front frill and a dorset button on each wrist cuff and the collar. It is rather roomy, but I am hopeful that it will still fit if he grows before April next year. 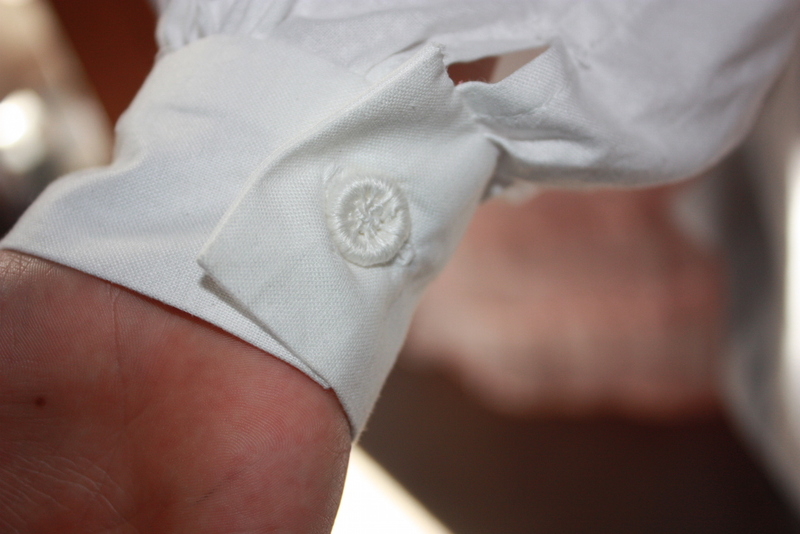 A little dorset button on the cuff. Showing a midshipman, master and commander, and a cabin boy. The midshipman’s stock appears knotted here. A black stock was considered the general sign of a military man in this period. Sometimes they were made into a short straight strip, laid on the front of the neck and then attached at the back with ties. Other times they appear to be a longer strip of fabric that crosses at the back and is knotted at the front. Bush felt the perspiration prickling under his uniform, and his stock constricted his thick neck so that every now and again he put two fingers into it and tugged, without relief. It would have been the simplest matter in the world to take off his heavy uniform coat and unhook his stock, but it never crossed his mind that he should do so. Bodily discomfort was something that one bore without a complaint in the world; habit and pride both helped. I have previously made a variety of cravats for my husband, but this time I particularly wanted a stock that knotted in front, similar to the painting of Midshipman Michael Daintry above. From the pictures I have seen, this type of stock appeared to be a long triangular piece that was folded, laid on the front of the neck, crossed at the back and then neatly knotted (with short ends) at the front. I used black cotton broadcloth and cut it with the long straight edge on the selvedge. The neckcloth is folded lengthways before being put around the neck. A black neckcloth for a midshipman. The long flat edge is cut on the selvedge, measuring 41 inches long, and the depth at the midpoint of the triangle measures 7.5 inches. All finished! And looking good so far. Next up, making a little midshipman’s breeches.